Prosecution replied that there isn’t. Prosecution would like to meet with the defense team to see if they have any agreements in regards to "for cause"
to conduct follow up interview with Conrad Murray”. The motion lists 4 separate failed attempts by law enforcement to reach Conrad Murray for an interview. with the law enforcement. The unreturned phone and e-mail messages will likely be used to counter the defense’s claim about Conrad Murray’s full cooperation and the motion alludes that the authorities tried repeatedly to get in touch with Murray to no avail. on June 27, 2009. They argued that it was only AFTER information from this interview leaked to the public that Conrad Murray decided to invoke his Fifth Amendment. The defense asked the judge to reject the motion, arguing that it "would create substantial danger of undue prejudice, undue waste of time, confuse the issues, or mislead the jury." The judge has yet to rule this motion. He will likely consider this issue on Monday. 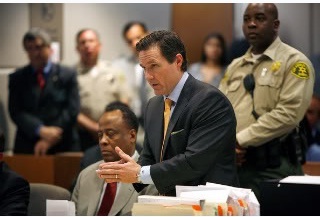 Today was the final phase of selection process for the jurors who will hear and consequently hand down a verdict in the Conrad Murray trial. The jury was empanelled after less than six hours of questioning by the judge, defense attorneys and prosecutors. Ed Chernoff previously had stated that they don’t have the money to assign a jury consultant but it seemed that somehow they overcame that snag. The defense retained a jury consultant to help evaluate the juror questionnaires. The prosecutor's office has used such consultants in the past but decided against it for this trial due to financial constraints. On September 8 and September 9, 145 jury candidates filled out a 30 page questionnaire, answering relevant questions posed by the prosecution and the defense. Both teams had a week to review the questionnaires. Today the candidates were summoned to the court for an in person questioning based on their answers on their questionnaires. Bailiff led 84 potential jurors into Judge Michael Pastor's courtroom in LA Superior Court for an in-person questioning based on their answers on 30-page questionnaires they had filled out 2 weeks ago. Of the 84 veniremen, only 6 were African American. Prosecution and the defense had stipulated on anonymous jurors so the prospective jurors wore number tags. Their badges didn’t have names on them and their identities are sealed. This prevents the attorneys conducting background check on the jurors. Judge Pastor quickly excused 10 of the 14 jurors who expressed hardship which prevented them from serving as a juror in the five-week trial. Remaining 74 candidates were questioned in groups of 27 who sat in 3 rows of 9 in the jury box. The judge questioned the prospective jurors first. The prosecutors and the defense lawyers were given only half of the normally allotted time to question the panelists due to the extensive nature of the questionnaire. Each side had only 20 minutes per panel of jurors. After the first batch of 27 people was qualified as unbiased, each side then exercised its peremptory challenges to dismiss people without stating any reason. Each side had a limit of 10 peremptory challenges in total. 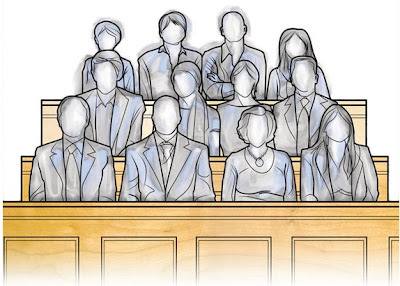 As jurors were dismissed, those seats were filled with new would-be-jurors. Edward Chernoff asked the group if there is anyone who've never read, heard or seen anything about Michael Jackson or Conrad Murray. No one raised their hands. Chernoff asked the group if anyone wanted to be a juror in this Trial because of either Michael Jackson or Conrad Murray. No one raised their hand. "Part of this trial, frankly, is going to be about Michael Jackson’s life. We're not going to drag up stuff that happened that people may not want to hear about” declared Chernoff, signaling that the defense will point fingers at the victim. "may be an interesting case" that may be "fascinating" for those who like "science." Chernoff started questioning by asking the would-be-jurors how they remember Michael Jackson. One woman said “I think of him as a child with the Jackson Five”. Chernoff then followed up by asking her ‘Was he so childlike that he was incapable of making decision?’ “No” answered the woman who DID end up as one of the selected jurors. "Anybody here believe that Michael Jackson is less capable of making decisions than anybody else his age?" Chernoff asked. Jurors shook their heads no. “Does anybody think that Michael Jackson should be held to a different standard of responsibility?” Chernoff asked. No one raised their hands. A nurse who got emotional during questioning by Chernoff was dismissed by the judge. An African-American woman who began crying during questioning was also dismissed. "the courtroom version of speed dating, trying to get the most information in a short time." 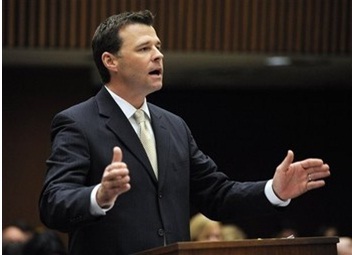 Mr. Walgren focused his questions on whether the candidates could convict Conrad Murray if they found that Michael Jackson contributed to his own death. Walgren asked the group to consider a hypothetical situation where a drunk driver runs a red light and kills a pedestrian who was “not being safe as he could be and steps out in front of a car. You could say the driver is not 100% responsible but he did play a substantial role? All said they could but one man who asked if the pedestrian had used a crosswalk was dismissed by the prosecution. One woman said she would "prefer not to be in a position where I would have to judge” but she assured the judge that she could be a fair juror. "If I have a job to do then I finish it" she said. The prosecution dismissed her. David Walgren noted that a man wrote, in his questionnaire, that he knew very little about the case. The man said that he always changed the TV channel with news coverage on Michael Jackson’s death so it would be easy for him to be fair since "everything I hear would be for the first time." The prosecution dismissed him. 2 African-Americans amongst the first 27 candidates were dismissed by the prosecution. To the question about whether she had seen 'This Is It' documentary, one candidate responded "No!" on her jury questionnaire. David Walgren asked her why she had put an exclamation mark. "That was an emphatic no. I wasn't interested" she responded. She was dismissed by the defense team. Ed Chernoff objected to the term “victim” during David Walgren’s questioning. “There is no proof of a victim” Chernoff complained. The judge asked Mr. Walgren use the term “alleged victim” instead. Prominent civil rights attorney Connie Rice was amongst the first 27 prospective jurors. She has criticized LAPD policies and filed class-action lawsuits over law enforcement misconduct. Judge Pastor asked her if she could be impartial in this case, she replied yes. Still, the prosecutor opted to use one of their peremptory challenges to strike Connie Rice. A man in his 50s disclosed that he met Michael Jackson in the 1980s while working on Captain EO. This man DID end up being selected as a juror (Juror #70) in the Trial. Also in the jury pool was a woman who is the secretary to an appellate justice who, weeks earlier, handled an appeal by Conrad Murray defense request for jury sequestration. In her questionnaire, she wrote that she saw Conrad Murray “convicted” on television. She clarified and said that she meant she saw him charged, not convicted. for her dismissal is sealed although one court spectator overheard that the woman acknowledged that she had dealings with one of the defense attorneys several years ago. She failed to mention this connection during the jury selection process but a man who had just been dismissed as a prospective juror gave this information about the woman to court officials. Consequently, judge Pastor dissmissed her. Trial will proceed with 5 alternates. "It seems like a good jury panel" said defense attorney, Michael Flanagan. the judge advised them not to "read, listen to or watch any news report or any other commentary about this case from any source" and to "keep an open mind throughout the trial." He then instrusted them to return to court Tuesday morning for opening statements. As mentioned earlier, the jurors will remain anonymous. They were assigned numbers. 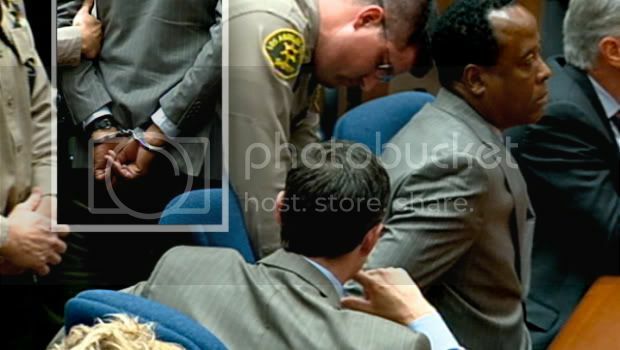 ﻿ Conrad Murray is changed with involuntary manslaughter. The prosecution and the defense will present contrasting portrayals of Michael Jackson in his finals days. Prosecution will argue that Mr. Jackson was healthy, vibrant and optimistic man capable of handling 50 shows. The defense will argue that Michael was frail, sickly and distressed man incapable of performing 50 shows. The defense will also point fingers at Mr. Jackson as a drug-addict who kept Conrad Murray in the dark about medications that other doctors had prescribed to him. Prosecutors will argue that Conrad Murray used a makeshift intravenous drip to administer anesthetic propofol and other sedatives without proper monitoring and resustitation equipment. 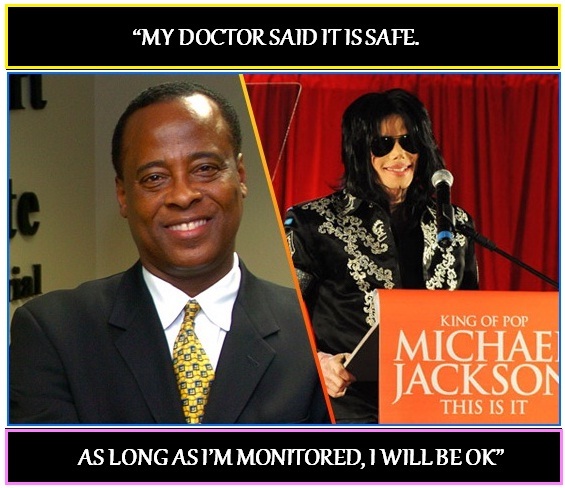 They will argue that Conrad Murray’s medical practices violated the standard of care and led to Michael Jackson’s death. 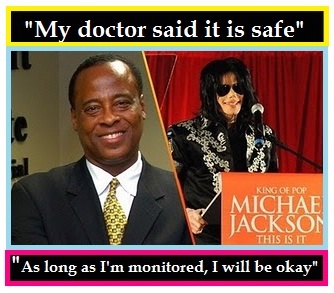 Although Conrad Murray is NOT charged with an intentional crime but merely for medical negligence, expect the defense to try to cloud the purpose of the Trial by slandering Mr. Jackson's character. According to Defense attorney, Ed Chernoff, maligning the victim in this case will be "the crux of the defense". Chernoff reiterated their defense strategy to prospective jurors, declaring that "part of this trial, frankly, is going to be about Michael Jackson’s life. We're not going to drag up stuff that happened that people may not want to hear about” The defense will argue that Michael Jackson drank Propofol whilst Conrad Murray was out of the room, causing his own demise. “I don't know if my doctor would honor my request not to write medical records. I think my doctor would say 'Go elsewhere.'" If convicted, Conrad Murray faces a maximum of 4 years in prison, consequently, he is likely to lose his medical licenses. His lawyers expressed that Murray is more concerned about losing his medical license than prospect of imprisonment.